There are several ways you can add milestones to a roadmap. 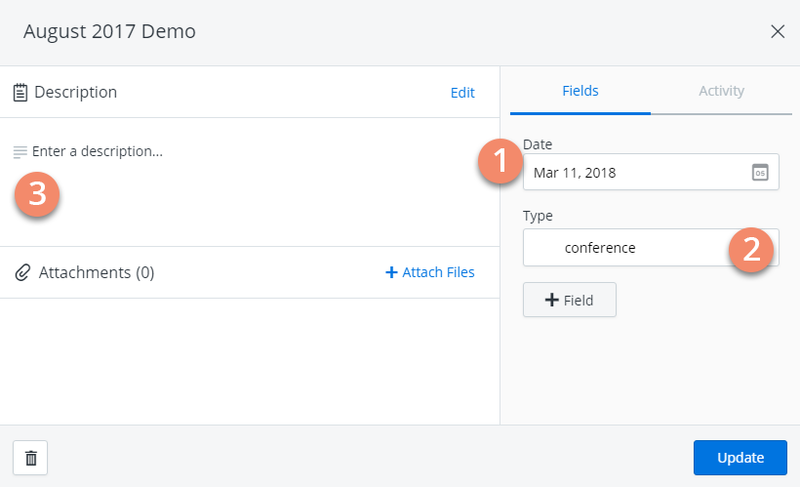 In this article we look at how to create and add a milestone in the Milestones Table and in a Timeline, and how to format the appearance of milestones. We also explain how filters affect the display of milestones and why they may not always be visible. IMPORTANT: Milestones are visible only in Timelines. The Milestones Table looks and works almost exactly like the Items Table. Every roadmap created from scratch starts out with three default fields in the Milestones Table: Milestones, Date, and Milestone Type. 1. On the Roadmap navbar, select All Data in the View dropdown (see why further in the article and in View All Data). 2. On the View navbar, select the Milestones icon. 3. Click the + Milestone button. 4. In the Create New Milestone dialog, enter a Milestone Name. This name appears in the Milestones field. NOTE: The dialog stays open until you close it so you can continue to quickly add more milestones one after another. The milestone gets added to the table as a new row and the Milestone Type field is automatically populated with the default value. To quickly add and edit milestone details, click inside the Description field to open the milestone card. TIP: You can also set the milestone's date and type directly in the table. 1. Click Date to open the date picker and select a date for the milestone. Unlike items, milestones have a single, specific date. 2. 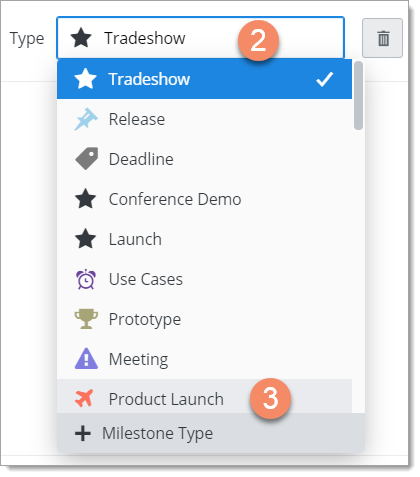 To change the milestone type, click Type and select a new value in the dropdown. 3. To enter a description for the milestone, click inside the Description field and start typing. TIP: You can use Markdown in the description. Click the ... icon below the text box to get syntax help. 4. When you're done, click anywhere off the card to close it and return to the Milestones Table. The Milestones Table is not the only place you can add milestones to a roadmap. You can also add a milestone simply by creating it and drag-and-dropping it onto a Timeline. Here's how. 2. In the dialog, set the toggle to Milestones. 3. Enter the new milestone's name. 4. Click the milestone's Move handle and start dragging the milestone onto the timeline. 5. Drop the milestone onto the timeline stream of the related item, then drag the milestone horizontally along the stream and drop it when you see the correct date in the popup. NOTE: The milestone's values for the Timeline's pivot fields will automatically be set to the header/sub-header that corresponds to the stream. A milestone's type determines its shape and color on the Timeline. The default is the first type in the Milestone Type field's value list but you can change the type in the milestone card. 1. Click the milestone on the Timeline to open the milestone card. 2. Click inside the Type field. 3. In the dropdown, select the new type. TIP: If you have the right Permissions, you click + Milestone Type at the bottom of the dropdown to add a new type if the one you want is not already on the list. 2. At the bottom of the Format panel's Layout tab, uncheck Show Milestone Dates. You can also change the shape and color of any milestone type on the Timeline. 1. Still in the Format panel, click the Colors tab. 2. Expand or scroll down to the Milestones section and elect the milestone type you want to format. 3. In the flyout, select the new shape and/or color. 4. Click the Format icon to close the panel. A view's filter set affects the display of milestones exactly the same way it affects the display of items (see Filter items). Any milestones that don't match the view's filter set are excluded from the view. This explains why a roadmap's Milestones Table may be blank even though the roadmap has milestones. You can view all milestones in a roadmap, with all filters removed, in the Milestones Table by opening the All Data view. Open the view by selecting All Data in the Roadmap navbar's View dropdown, then click Milestones on the View navbar. If you don't see the Milestones icon on the View navbar, it's because the open view's visualization is a Swimlane. If you open a view with a Timeline visualization, the Milestones icon will appear. Like items, milestones are affected by filters so they will not be visible in the Milestones Table or on a Timeline if they do not match the open view's filter set. In other words, if a milestone does not have matching values in the view's filter fields, it's not visible. 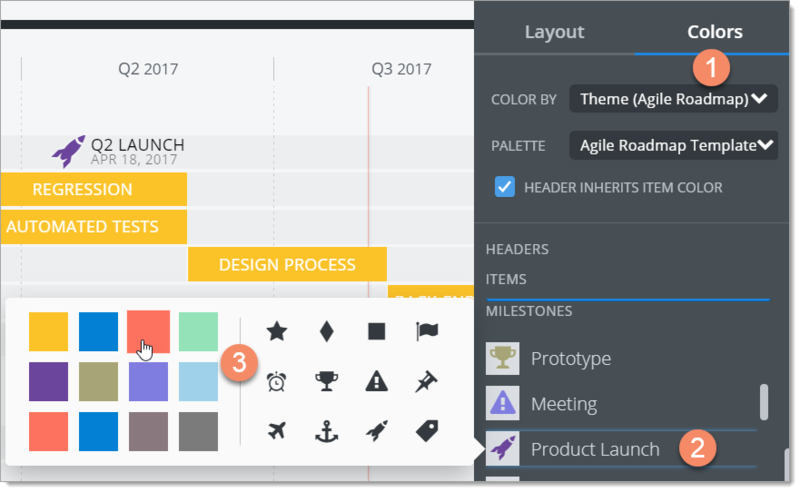 The easiest and most logical way to make a milestone visible on a Timeline is to add it by using drag-and-drop like we showed you earlier in the article (Drag-and-dropping a new milestone onto a Timeline). Adding a milestone this way automatically populates the milestone's filter fields with matching values based on where in the Timeline the milestone is dropped. Who can add milestones to a roadmap? 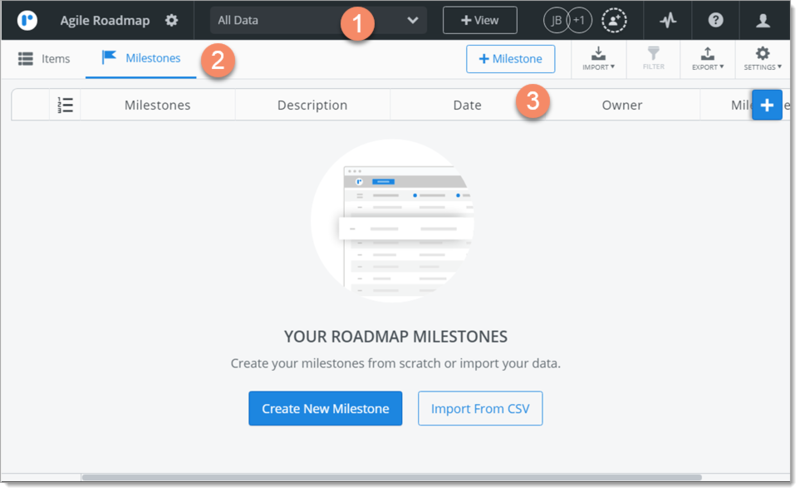 To add a milestone to a roadmap, you must be the roadmap's Owner OR the roadmap must be shared with you as an Editor. If a roadmap has been shared with you as Viewer, you have view-only access to the roadmap and can't add milestones to it. As a Viewer, the + Item button on the View navbar will be grayed-out and you will see a View Only icon on the Roadmap navbar.